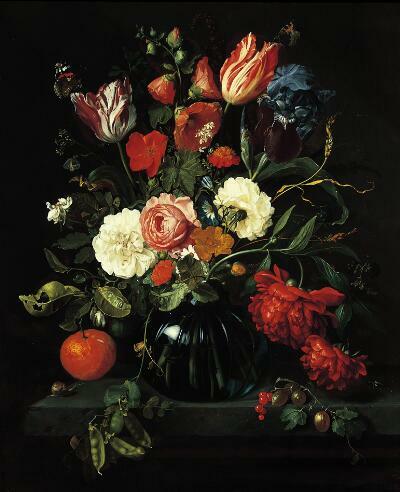 Utrecht-born Jan de Heem specialized in virtuosic flower and banquet pieces that were enthusiastically collected by aristocrats and wealthy merchants alike. This exquisite still life presents a harmonious marriage of color and line and attests to the artist’s ability to describe with great precision a range of forms, textures and colors. All the elements are ordered along several axes that meet at the center of the composition, while myriad details throughout, including flowers rendered with the accuracy of a botanist, encourage prolonged examination. However, the sense of movement created by these dynamic lines guides the eye through the still life, so that it does not rest on any one particular detail for too long. The vanitas theme that was so popular in early examples of the genre waned by the second half of the 17th century, as an interest in the decorative supplanted the emphasis on moralizing iconography. Though de Heem included certain symbols associated with the theme (drooping flowers, a shaft of wheat and short-lived insects), his focus lay in the bravura painting of beautiful motifs in arrangements that signify abundance. Lt.-Col. Alfred Henry Hudson (1850-1946? ), Wick House, Pershore, Worcestershire. During the 17th century, Dutch merchant vessels sailed all over the world, and a newly prosperous middle class created a market for paintings to grace their tidy homes. In a land of cold grey winters, flowers were a popular subject. This exuberant arrangement by Jan Davidz. de Heem fills the entire canvas. It’s a fanciful array, for in nature, these flowers blossom at different times of the year. Using swirling stems, leaves and petals, de Heem leads our eyes around his painting. He offers numerous paths for us to follow—one begins at the drooping peas at the lower left, curves up to the cluster of flowers at the very center then continues to the right along a graceful stalk of wheat. Its tip curves inward again to point us on to the topmost blossoms. The bulbous shape of the glass vase is reinforced by decorative lines that sweep in to converge at the center, balancing and reflecting the burst of foliage above. This may be a still life, but nothing in it seems still. Its brilliant color, irrepressible energy, and continuous sweeping motion are hallmarks of the 17th-century style called the Baroque. Like much Dutch art, flower paintings often contained moralizing messages. Here, amidst the natural splendor, you’ll find signs of death and decay. For example, at the left of center, the white rose is being attacked by insects. They have already ravaged leaves nearby. Below, the orange is tinged with mold. Such elements are meant to remind us of the fragility of life and the certainty of death, underscoring the popular idea of vanitas, the vanity of attachment to worldly things. Elsewhere we’re reminded of the Christian promise of eternal life. Those peas, for example, refer to Christ’s death and resurrection, for they must be buried in order to come alive again. And the butterflies balanced on the blossoms signify the soul, ready to wing its way towards heaven.